The best way to cut corn off the cob begins with a cake pan. Fresh corn kernels, good as gold in my book. Even as I child I loved fresh corn. Commandeered by my grubby little hands, the ear was destined for a spinning log roll on the butter stick and to be eaten as I saw fit. Finger licking was a must, chin wiping optional. 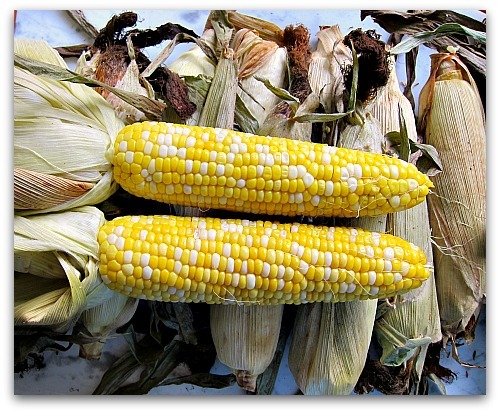 At one backyard cookout, a family friend bristled at this American practice, and furthermore cited corn was pig food in her home country of Italy. I thought, wow, lucky pigs. 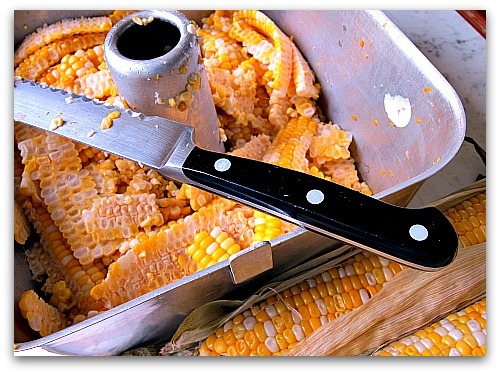 When it comes to removing corn from the cob, the task can morph into a messy and dangerous counter encounter where pearl round kernels roll onto the floor, juice forms puddles and ponds, and fingers cope with sharp knifes and surface slippage. This is where we say (in unison), “There has to be a better way!” I’m here to tell you and show that there is. 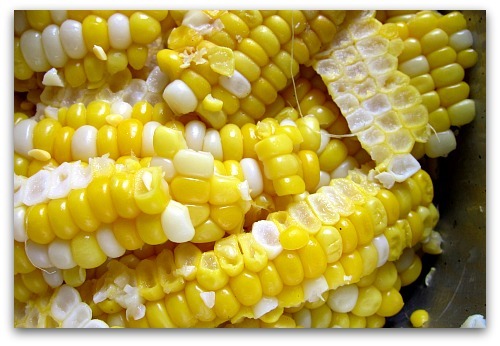 Click on the image below to launch my how-to video on an easy and ingenious way to remove the kernels from the cob. Better suggestions? I’m all ears! Seven sides is a Heptagon 🙂 Great video! Although, while you were doing it, I was wondering if it might work better a different way. Put the “tip” of the corn in the hole, and use the the stem as a handle? You’d sacrifice a few kernels, but you might save your fingertips…but maybe that’s only us klutzy cooks that need to worry about that! Joanne you got the smarts! A Heptagon, who knew? Here’s what they look like: http://www.mathopenref.com/heptagon.html And your tip-down idea is nothing short of brilliant. I may have to update with the new JoanneNicole protocols. Thanks! Are you wearing the camera on your head? I LOVE these videos. It’s so nice to hear you and be in your kitchen. AND, the wealth of information. I’m tellin ya!! Off to the dahlia farm and stopping by for some corn on the way home!! OMG this is great! I get to learn how to cut corn off the cob and I get to see Tommy!!! Ingenious, indeed. The corn and the video! Tom – what a great idea! I love it! Oooh..messy. I husk, remove silk cut both ends off. outside! Then blanch 3 min, cool in sink (changing water) then cut off, large side down.Just froze 70 1-1/2 cup bags with 3 people working. By myself I do about 8 bags at a leisurely pace. Deb, messy is my middle name. I long to be a neatnik. Hey congrats on the amazing assembly line of corn cob cutting efficiency. Nice work. Delightful, as usual ! now if I could just find some corn …. Brilliant! Fun….. and who cares about geometry (said the jr-high teacher) the important fact check is……..cobs are for the girls who lay the eggs!!! Seriously, I have pounded a nail into a small chunk of board, stabbed the WAY too hot cob on the nail (seasoned with my own blood more times than not) cut the slippery buggers from the cob watching them spread across the counter. All this time I had an angel food cake pan (is it called a tube pan?) sitting in the depths of my back cupboard, dusted off in March for a spring cake. WHAT?!? My stand of corn is days away from angelic pole dancing. Thanks so much for my morning laugh, happy video. Debs at the Toy Box Suburban Farm. Debs, thank you for the laugh (though sorry about the corncob cutting wounds), and I think you need to post a video yourself, say one of the angelic pole dancing event. Oh yeah! Thanks for posting this. I would have never thought of pre-cooking the corn.